It’s hard for me to believe that I am going into my third year of university. This means that I am almost half-way done, and I should really be getting this whole “university” thing down pat. While I am not sure if I have really figured out university, I realized something that I wish I understood earlier. And that is: University can be REALLY flexible so take advantage of it!! We all come into university from high school, where the schedule was rigid and there was just a specified list of courses which you have to take. Then for university we picked a program from a list of specified programs that were advertised to us and just try to fit ourselves into that program. For me, I started out in the Double Degree program studying Computer Science at UW and Business Administration at Laurier. This was a program that was very rigid and you have to adhere to its schedules without any deviation. But then I realized that I don’t actually like business at all, and I just did it because I wanted to have something complement my CS degree, and I thought there was no other program that would allow me to pursue CS along with another field. But then I finally did something that I had yet to do up to that point in my undergrad career: Look at the degree requirements of CS and start planning for the future. Through my research I realized that with along with CS we can do minors, joint majors, and even double majors! I mean when you really think about it, to get a degree, you just have to fulfill all the degree requirements; so if you fulfill the degree requirements of two majors, then you get two majors! Such a simple fact that just never hit me. Then I really took some time out to plan out my undergrad years. This is something I hope all students will try to do. It’s really not high school anymore where there are just a few courses to choose from and everyone pretty much takes the exactly same things. In university, there are so many more courses and different paths to take. Below is the chart I made where I went through the degree requirements and plotted exactly where I wanted to take which courses. 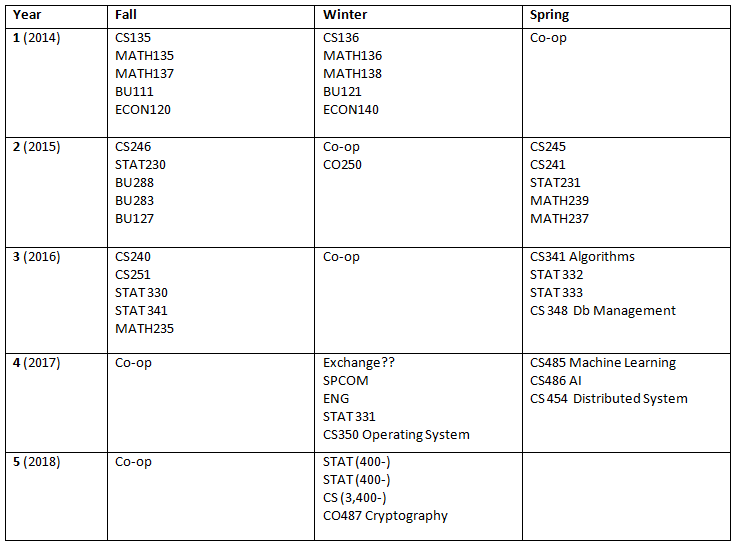 CS at Waterloo is very flexible in that there are many spaces for electives, and most of the courses are offered year-round. Since I knew I had an interest in statistics and also going to data science, I looked into fitting a Statistics joint major or double major into my schedule. It fit pretty well, and reading the descriptions in the course calendar really made me excited to take these courses. I was no longer confined to the programs listed on a brochure, because now I know you can customize your own program to fit YOU. And that is when I switched out of double degree to pursue my double major in CS and Statistics. With this, I can actually take the courses that interest me, and have freedom to shuffle around my co-op terms, as well as fit a term to do a global exchange. The future is no longer vague to me, and I can take control of my career rather than wait for an double degree academic advisor to tell me when to take what. TLDR: Do your research about the programs and degree requirements in the Math faculty at Waterloo, you would be surprised how flexible it all can be. Create your own program, and take the courses that you want. Double major in Physics and CS, or Statistics and Combinatorics, it is all possible if you just try. University is a time to explore your interests and tailor the journey to your own likings. Life’s too short to settle.